Do you scare easily? Does the idea of exploring a big, dark and imposing mansion send shivers down your spine? How about if it’s known to be the most haunted house in Ireland, would you go in? Last week I booked a ticket for the Loftus Hall ground floor tour for Shane, I was tempted to do it myself but I was afraid it wouldn’t be appropriate for the kids so my plan was to play on the grounds with them while daddy took the tour. We headed down to Wexford after lunch last Tuesday and as soon as we arrived we could feel this would be a great day out. The sun was beaming and the sea was a mass of glistening diamonds behind the grounds of Loftus. We decided to just chance it and see how the kids got on with the tour and the receptionist promised it wasn’t too scary! We trusted her! The two smallest were free entry so we paid €25 for the tour and to our surprise we found on the grounds we could also take part in archery, a fairy door treasure hunt ( maps provided ) and a mega bouncy castle at no extra cost. They have a nice café area with courtyard seating and a little gift shop for keepsakes and souvenirs. Our tour began at 3.30pm, we were led into a hallway by our guide and immediately the temperature drop was noticeable, we were now inside the main house, inside the old cold stone walls of Loftus Hall! Our guide was good fun, he really knew the history and story of the house and he delivered his speech with a perfect mix of intrigue and wit and the odd spooky suggestion to keep us all laughing slightly nervously! Parts of the house tour involved dark or very dimly lit rooms so Spence wasn’t keen on that and at those times our guide left me in brightly lit areas just the other side of a door from the group, he was really great about making sure we were comfortable. The other kids got a little spooked but only in a light hearted fun way! Exploring the gardens and hunting for fairy doors was our next activity and it was such fun! Beautiful grounds, orchards, trees growing in corners where we could all duck down and scuttle underneath the low branches into exciting hiding spots and dens! The archery was a giggle; proper big bows and arrows with soft pompom tips so it was safe fun to take aim at each other! A few minutes on the bouncy castle to round off our visit and we bid our goodbyes and thanks at reception. 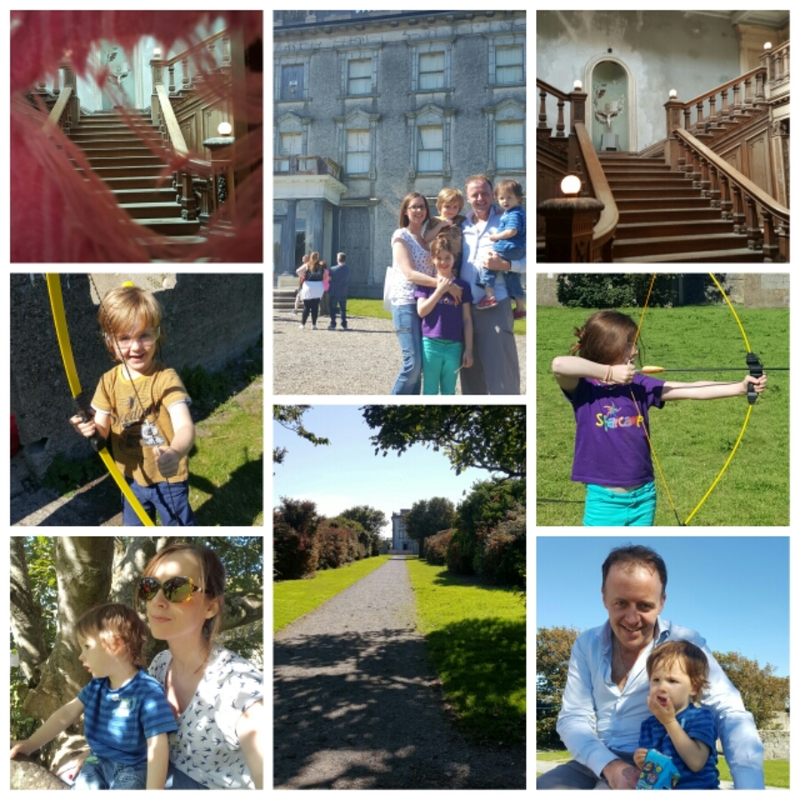 Loftus Hall had so much more to offer than I had expected, it was a pleasure to visit and spend half a day there and had the kids not wanted to do the tour, we’d have been delighted to run and play and wait for daddy to come back from the dark side….! By the way, have you heard the ghost story associated with Loftus? In 1977 while the Tottenham family were taking care of the mansion, an unexpected ship arrived into Hook Peninsula during a storm. A young man was offered lodgings at the mansion, he and the daughter of Tottenham, Anne, became close. One night during a card game, Anne leaned over to pick up a card from the floor and to her shock found her companion had a cloven hoof. She stood and announced her discovery and the young man shot from his seat and through the roof. Anne’s mental health suffered from then on, she was most disturbed by events of that night and her family, embarrassed by her state, locked her away in her favourite room, the Tapestry room where she refused food and water. She sat with her knees under her chin looking out the window towards Dunmore East awaiting the return of her companion. When she died, it’s said that her body could not be straightened and she was buried in the same folded up position she died in. Her ghosts has reportedly been seen roaming tha corridors of Loftus Hall.